Note: Per Garmin, even though this product is certified, we can only sell over the counter to experimental aircraft (must verify) with wire harness. 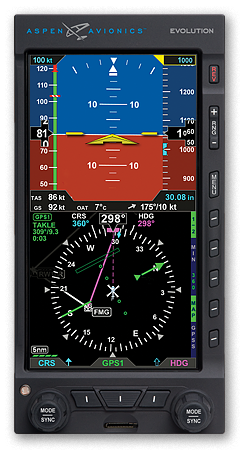 GTN 725 has a 6.9-inch (diagonal) display, touchscreen interface and a range of multifunction display capabilities, and it’s ready and approved for installation today in hundreds of makes and models aircraft, including helicopters by the U.S.’ FAA, Europe’s EASA, Canada’s TCCA and Brazil’s ANAC authorities. 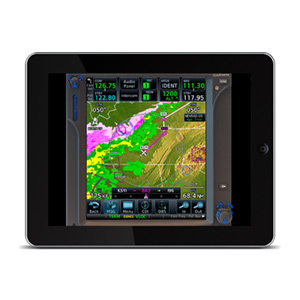 It puts high-resolution terrain mapping, graphical flight planning, charting, advanced navigation, traffic display, connectivity and multiple weather options right at your fingertips. 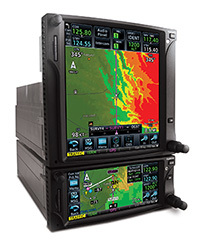 With GTN 725’s touchscreen interface, you’re rarely more than 2 taps away from the system’s primary functions. 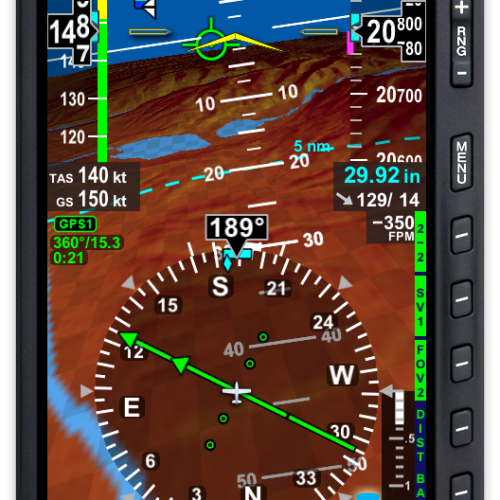 Enter waypoint data on the high-resolution TFT display and swipe your finger across it to pan the map screen. There are multiple ways to reach information and lots of shortcuts built right in. The data displayed can easily be customized to instantly reach any page in the system right from the moving map or navigation pages. So it’s easy to fly with the information that’s most important to you while flying. Built-in gripping points on the bezel and lower edge of the display help you stabilize your fingers while using the touchscreen in-flight. Not keen on touchscreen data entry? GTN 725 also has traditional concentric knobs. And, with a GNS 430W/530W, your active flight plan automatically crossfills from the GTN to the GNS. You can also manually crossfill waypoints. Edit your entire route on the map screen and easily enter new waypoints or modify existing ones. The system even lets you load Victor and jet airways. Grab any leg of your flight plan route and move it to accommodate a deviation or ATC amendment to your flight plan with the “rubber band” feature. Enter your most recently visited or nearest airports as waypoints and “Direct To” destinations. Built-in Garmin FliteCharts™ available for the U.S., Europe, and Canada or optional Jeppesen®-style geo-referenced ChartView™ provide geo-referenced approach plates and procedures. And borrowing advanced navigation from our top-end flight decks, the GTN 725 provides the ability to create and execute custom holding patterns over an existing waypoint or user-defined waypoint. This same technology simplifies search and rescue operations with selection of four common search pattern types for easy entry into the flight plan including, Orbit Search, Parallel Line Search, Expanding Square, and Sector Search pattern types. In addition, precise course deviation and roll steering outputs can be coupled to select autopilots so that IFR flight procedures may be flown automatically. This includes all ARINC 424 leg types, including NextGen radius-to-fix (RF) legs. And when coupled with a G500/G600 flight display and compatible autopilot, the aircraft can fly fully coupled missed approaches, including heading legs as well as holds and search and rescue patterns. The SBAS/WAAS-certified, 15-channel GPS receiver generates 5 position updates per second, letting you fly GPS-guided LPV glidepath instrument approaches down to as low as 200 feet. In addition, precise course deviation and roll steering outputs can be coupled to select autopilots so that IFR flight procedures may be flown automatically. This includes all ARINC 424 leg types, except RF legs. For example, when coupled with a G500/G600 flight display, the aircraft can fly fully coupled missed approaches, including heading legs. Packed full of multifunction display capabilities, GTN 725 brings enhanced situational awareness to your cockpit. High-resolution terrain mapping — including topography features, cities, airports, terminal areas, SUAs and optional Class A and B TAWS alerting — you’ll safely find your way around sectional-like airspace depiction, with convenient altitude limits right on the moving map. When interfaced with a compatible fuel computer, a circle is depicted around the aircraft that indicates the estimated distance of travel to reach the aircraft’s fuel reserve and empty fuel conditions. Smart Airspace™ automatically highlights airspace close to your current altitude and de-emphasizes airspace away from the current altitude. On the ground, built-in Garmin SafeTaxi® airport diagrams show you geo-referenced runways, taxiways, FBOs and hangars available in either the U.S., Europe or Canada. The dual-link GDL® 88 allows GTN 650 to display up to 60 ADS-B traffic targets. TargetTrend™ relative motion technology gives you a faster, more intuitive way to judge the direction and closure rate of intruding targets in relation to your aircraft’s position. TerminalTraffic provides pilots with the most comprehensive picture of ADS-B-equipped aircraft and ground vehicles in the airport environment. ADS-B-equipped aircraft in-flight are easily distinguished from ground vehicles and taxiing aircraft, which are displayed using distinct colors and symbols. All of this information is presented to the pilot on a simple, easy to understand SafeTaxi®diagram with reference to runways, taxiways hangar locations and more. Additionally, when configured for helicopter operations, TerminalTraffic helps pilots easily distinguish potential traffic conflicts while in the airport environment by minimizing nuisance alerts from fixed-wing aircraft and abbreviating select alerts while performing unique helicopter maneuvers such as hovering. For helicopter use, our exclusive On Scene traffic mode helps pilots prevent continued traffic alerting when they’re aware of other traffic in the vicinity. The GDL 88 can also receive the FAA’s subscription-free FIS-B weather broadcasts that include graphical NEXRAD radar information, as well as NOTAMs, METARs and TAFs. GTN provides GDL 88 with the WAAS position source required for ADS-B, so a WAAS version of GDL 88 is not required. 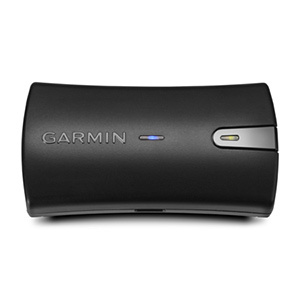 Add a Garmin Traffic System to compliment GDL 88 for the best possible traffic coverage. 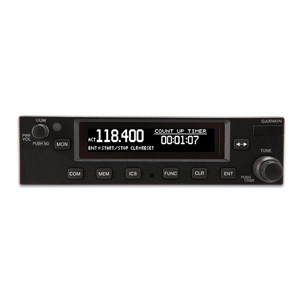 Add a GDL® 69/69A datalink receiver for XM WX Satellite Weather and SiriusXM Satellite Radio (subscriptions required). 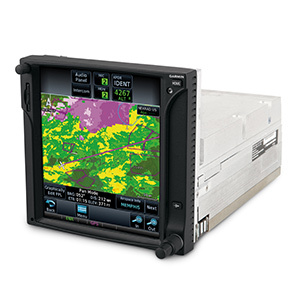 An optional GSR 56 provides World Wide Weather data almost anywhere on the globe, as well as the ability to make and receive phone calls and send and receive texts messages while in the air. To help pilots better understand weather trends, all of the NEXRAD or graphical datalink weather options are animated. You can also collect and display weather data with an onboard weather radar, such as the solid state and Doppler-capable GWX™ 70, which has optional turbulence detection and ground clutter suppression features. And for easy access while viewing other items, the GWX 70 can be conveniently displayed and controlled right on the moving map page. 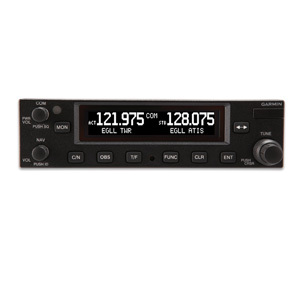 GTN 725 can control the GMA 35 remote audio panel with 3D Audio, Telligence™ Voice Control, clearance recorder, advanced auto squelch and more as well as the GTX™ 33 remote transponder. When installed together, it saves you up to 3 inches of panel space (compared to a GNS 430/530 install). 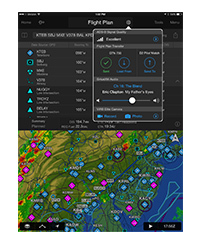 Let our Connext family of products keep your flight plans in sync and stream weather, traffic, GPS, and attitude information to select Connext-capble apps and Garmin portables like Garmin Pilot™ by simply installing a Flight Stream 210. Use the flight plan already created and filed from Garmin Pilot to easily sync to your avionics upon hopping in the cockpit. And once airborne, it’s easier than ever to keep in sync with an ATC amendment — with only a button press or two a new route updated on either the GTN or Garmin Pilot without cumbersome re-entry. You’ll also be streaming all of the weather, traffic, GPS and attitude information that your avionics is already providing which makes it easy to cut down on the cockpit clutter of other portable wireless device(s). The GTN 725 is available with a number of optional enhancements specifically designed to meet the unique demands of helicopter missions. It’s been designed to meet the stringent helicopter vibration and temperature testing standards needed for environmental qualification, and it’s approved for installation in the most popular makes and models helicopters by the U.S.’ FAA, Europe’s EASA, Canada’s TCCA and Brazil’s ANAC authorities. It also features a helicopter-specific obstacle database that adds nearly 30,000 low-altitude obstacles, as well as a navigation database with heliports and high-resolution terrain database. Remaining aware of where the wires are has never been easier than with Garmin WireAware™, wire-strike avoidance technology. WireAware graphically overlays the most comprehensive powerline information right on the moving map page for the U.S., as well as in some locations in both Canada and Mexico. In addition to its comprehensive coverage, using WireAware adds Hazardous Obstacle Transmission lines that span rivers and canyons and the like, which are particularly dangerous for aircraft. Nobody depicts powerline information quite like the GTN, each segment of the wire can be touched to instantly reveal both MSL and AGL — and they’re also included in the obstacle alerting so they’ll shade either yellow or red given your distance to the lines. For the ultimate safety solution pair optional HTAWS alerting to provide 5-color shading and audible alerting to show nearby terrain, obstacles and wires in proximity to your helicopter as well as voice callouts when descending below 500 feet. And when you’re in the know of potential hazards, you can use our reduced protection and inhibit modes to help keep alerts to a minimum. When paired with a GRA 55, the GTN can be used to display the altitude and adds HTAWS alerting down to 50 feet. The GTN 725 has a front-loading SD™ card reader, making database updates easy. Keeping all of your GTN databases in sync has never been easier — simply update 1 GTN and the other downloads the databases automatically, saving valuable time during the update process. Further, database preloading allows pilots to load the next release cycle in advance and activate upon the effective date, making it more convenient to fly with the latest information. PilotPak™ database bundles are available for single aircrafts. 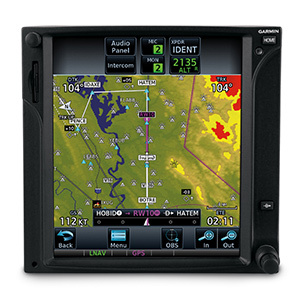 VisitflyGarmin.com to learn more. 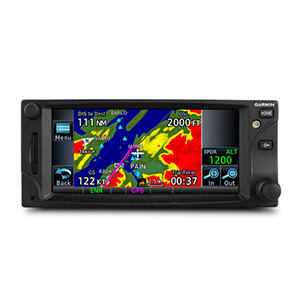 GTN 725 is now available for purchase from an authorized Garmin dealer. See it in action at an upcoming seminar or in person at a demo dealer location, or with our free downloadable PC Trainer or iPad® app.